When we got our hands on a modern-day smartwatch for the first time back at the end of 2013, we weren't quite sure what to make of this new paradigm. Here was a whole new category, with hype around it reaching a crescendo, and many wondering if it wasn't destined to take a place next to smartphones by providing a lucrative new revenue stream for traditional and emerging gadget manufacturers alike. Entrants — such as Pebble — definitely made a small fortune on the form factor, but things have been rather quiet overall. That is, until Apple announced that it's going after the still small and highly niche market with its own Watch. By then, however, we had an entirely different view on smartwatches. Smartwatches weren't going to be as big a deal as smartphones were (and still are) — not even close. Instead, their function would be auxiliary at best. For the time being, this is a more than fair assessment — some would, for example, go as far as saying that they're useless. 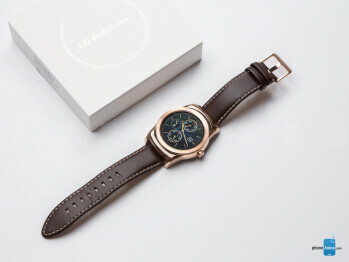 But there's a problem with that mindset, and one that LG, among others, has been trying to address with its latest smartwatches, but most notably — with its new Watch Urbane. So what's wrong with that aforementioned assessment? Basically, all the hype raised expectations way beyond what is practically achievable on a gadget that has to conform to your wrist. Indeed, now more than ever, the way forward seems to be for manufacturers to go after a blend of useful features and more classic, less-intimidating design choices. Certainly, LG has taken this philosophy to heart with the Urbane. Let's see how well that worked out. Square or rectangular, round or oval, there's no single form factor to rule them all when it comes to watches — smart or otherwise. Like so many other things in life, it's a matter of taste. 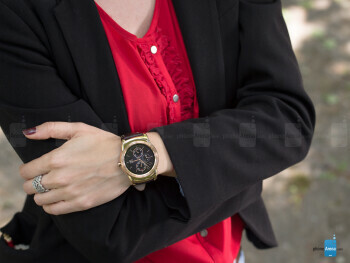 But be that as it may, we have no qualms about calling the Urbane one of the most dashing smartwatches currently on the market, and that includes the Apple Watch. LG's latest wearable comes in two color options as pertains to the stainless steel body of the watch — silver and gold (though that one looks like copper). In almost every way, the Urbane reminds us of its predecessor, the Watch R, but there are some important differences. For example, the pronounced defensive bezel of the R is much more subdued on the Urbane, and while that means that the display is less protected from bumps and scratches, we do appreciate the look of it more. Also similar is the sleep/wake crown dial on the right of the newer smartwatch, though it's slightly smaller, all the while protruding more. 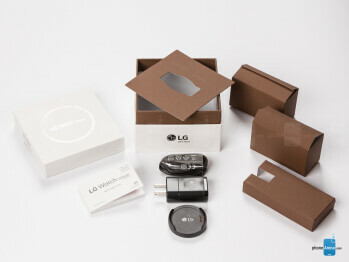 At the back, we see that LG has found a way to remove the four unsightly screws holding the gadget together from view. LG has done some splendid work in other important areas as well — like straps. Not only are we treated to a genuine, stitched leather strap this time around, but you can switch for another, at least so long as it's 22 mm in width. 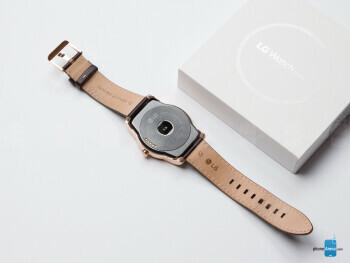 In all, from the smaller, more elegant clasp and duo of free loops, down to the skinnier default strap, the water- and dust-resistant Urbane is LG's best shot at blending gadgetry with classic timekeeping yet. Just make sure you pick the color option that will better match your wardrobe. LG is sticking with a display of proven quality — a round, 1.3-inch P-OLED panel with 320 x 320 pixels, or the same model it's using with the Watch R. From what we've seen so far, the two render rather identical images in terms of brightness and color reproduction, though the Urbane does look a little warmer. Generally, there are no visible improvements to speak of. Unlike Motorola's Moto 360, the Urbane doesn't feature an ambient light sensor, which means that tweaking brightness falls on you. Android Wear allows you to do that from the main screen — just slide down from the top, as you would with your notifications bar on your smartphone, and you can activate 'Brightness boost'. With summer right around the corner and all, this is sure to come in handy, and soon. Lastly, as fellow smartwatch owners would expect, LG's gadget's screen is set to always-on, so you can take a peek at the time and any new notifications without having to manually wake up the device. The Watch Urbane comes out of the box with the latest Android Wear update on board, which puts it in a very advantageous position compared to older smartwatches — at least for a time. Indeed, even our still fresh resident LG Watch R is stuck with the older, more basic Android Wear version, and is therefore no match for the Urbane functionality-wise. One of the many new additions is the ability to only receive priority notifications or none at all (a DND mode). Another handy feature allows you to tweak font size. Google has finally also realized that endless vertical lists of actions and apps just aren't cutting it anymore, so the main menu is now split in three horizontal 'tabs' that you slide through easily. The first one contains your apps, so you no longer have to hunt for them for what feels like eternity, while the second tab has your contacts. The last tab is dedicated to Google Now and the various actions it can perform. We're also happy to say that we've noticed a healthy growth in the number of dedicated apps and apps that have some kind of Android Wear support baked in. This is especially noticeable with watch faces — the selection has grown tremendously in the past 6 months, though we'd obviously prefer that more of them were free of charge. We'd also appreciate a revamp of the stock Android watch faces, as most of them are just poorly designed and particularly unsuitable for smartwatches that try to look like normal timepieces. But by far the coolest new feature of the Urbane is the ability to call people through it, making it an excellent choice in situations such as driving (where you have your _phone_ paired with your car's infotainment system). Of course, the calls themselves are relegated to your smartphone, but the Watch will seamlessly download your recent and favorite contacts, and will even whip out a dialer in case you need one. On a more negative note, Google's latest version of Android Wear on the Urbane is prone to crashes and slowdowns, and we found no obvious trigger for either. It's just something that we had to live with, annoying as it was. For example, on two occasions, we were greeted by an error message that claimed that Android Wear had stopped working, which resulted in a completely unresponsive device that couldn't be restarted unless you pressed and held the crown for about 10 seconds. 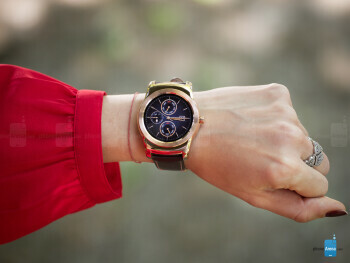 LG and Google better iron these out, and quickly — smartwatches are already a hard enough sell. If you've ever used, or at least seen an Android Wear smartwatch in action, then there should be no doubt in your mind — the entire premise of the platform is to give you convenient access to Google Now. The rest, at least originally, was just extra. Google Now can do a ton of stuff — it can turn speech to text and send it off as a message or keep it as a note, it can set alarms, tell you the time and weather, initiate navigation, and pull out all kinds of information from the web in a succinct, easy-to-digest format. Until the Watch Urbane, however, all these queries had a pretty inefficient way of reaching the brain — your smartphone — and serving it all the way back to your smartwatch. Basically, you'd call upon Google Now, ask this or that, wait for your speech to be recognized after a trip to your phone, and then wait for the answer to populate on the tiny screen via Bluetooth after your _phone_ had used its own Wi-Fi radio to ask Google's servers. With the Urbane, we finally have something far more robust. Yep, LG's new smartawtch has a tiny Wi-Fi radio on board, allowing you to cut the middle man when you're connected to a local or public network. In essence, speech recognition and resulting answers are being handled by the watch itself, so you're cutting out Bluetooth out of the picture. This cuts the time needed to satisfy your query significantly, making Google Now a far more enjoyable piece of functionality. A gyroscope, an accelerometer, a barometer, and even a heart rate monitor — these are the tiny sensors in the Watch Urbane that allow it to assume the role of a fitness and health tracker. It can count your steps, estimate altitude and how fast you're going, and even measure your heart beat. All of this is information that dedicated apps can make good use of to provide you with an overview of your workouts and suggest improvements. But you don't need to depart the Google ecosystem unless you want to — the Android maker's Fit app, while bare bones, can keep track of your activities — over 50 different types, including wakeboarding, water polo, zumba, yoga, and many more. Unfortunately, this is still very much a manual process, and very far from a plug-and-play type deal, so if you're serious about your training, then look elsewhere. 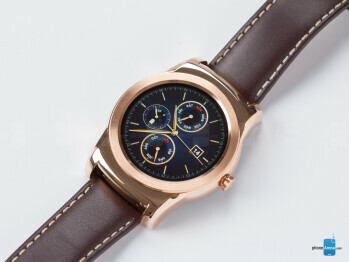 LG is using the same processor and memory chip that it used with the Watch R for the Watch Urbane. We're talking a 1.2GHz Qualcomm Snapdragon 400 chipset with 512MB of RAM available. Like before, the configuration is capable of pushing the software at very agreeable speeds, save for the aforementioned, occasional slowdowns. If anything, we'd argue that the Urbane even feels somewhat more responsive than the Watch R, despite the identical hardware. As for storage, there are 4 gigs available. In our experience over the past year, that has been more than sufficient. You can't watch the last episde of Game of Thrones on the 1.3-inch display of the Watch Urbane, even if you were so (masochistically) inclined, so knock that silly thought out of your head. In fact, you can't even listen to music through it — it has a microphone, but no speaker. Indeed, the only media purpose the Urbane can serve is to offer you quick access to playback controls — next, back, volume up, volume down. We've noticed that this is especially useful when behind the wheel, at least if you stream music from your phone to your car's system over Bluetooth and have no controls for it on the steering wheel. That way, you don't have to take your hands off at any time. Even better — apps like SoundCloud and Play Music push controls to your device, too. Like the LG Watch R, the Watch Urbane also comes with a plenty generous, 410 mAh battery embedded within its body. With it, we're easily able to squeeze a day of usage, even when notifications are bombarding the watch every few minutes. 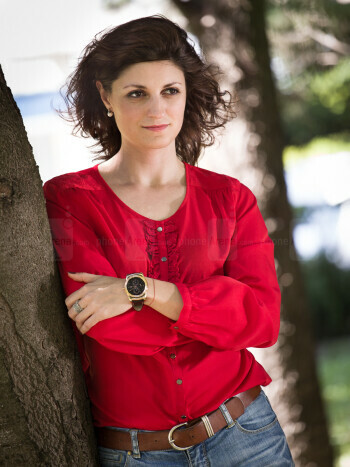 In fact, when we go easy on it and use it as we would on average, we usually manage to get two days on a single charge, so longevity remains a considerable advantage of LG's line of smartwatches. 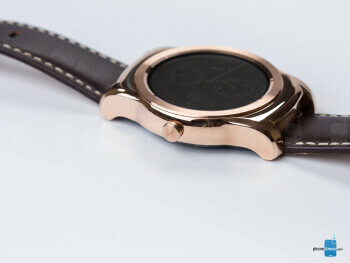 For charging, LG is providing you with a small, microUSB-connected cradle, which is about the size of the Watch Urbane's body. Contact is established through 5 magnetic pins that easily find their way to their counterpart in the cradle. Typically, you'll need about an hour to charge from zero to full. In our mind, out of all the smartwatch makers on the market right now, LG is one of very few that seems to get it — a smartwatch needs to blend in, and not stand out, in order for people to consider purchasing it. It also needs to be well-designed, made out of respectable materials, and not require constant charging. 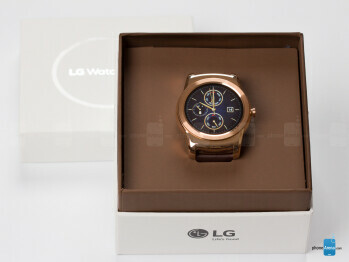 LG has arguably scratched all of these requirements off the list with the Watch Urbane. We also appreciated the organizational nature of the latest Android Wear update, which turned chaos into order, and even brought a few extra features to sweeten the pot for prospective buyers. Some of them would argue that the $349 price tag is steep, but then again this is currently best-in-class, at least as far as the Android part of the world goes. Calculating for the $349 Apple Watch Sport is a bit harder, for its feature set is currently sounding more promising, and we're expecting this to become the norm — after all, Apple's platform has always been the more lucrative choice for developers. Of course, if you're considering one, you're unlikely to be thinking about the other, seeing as how they're both limited to competing platforms — a choice that you will have already made before shopping for a smartwatch. As a standalone product, however, we have to call this a near tie — the Urbane is arguably the more attractive male choice, and it offers significantly better battery life, while the Watch Sport appeals to a broader demographic and will likely continue to prove more useful in your everyday wanderings.